It’s Week 1 of the CSA summer share! This week I have three CSAs starting up: My vegetable CSA launched on Tuesday, tonight is The Piggery (for which I am CSA coordinator in Manhattan; High Point Farms is also launching summer meat tonight, but I’m taking the summer off after enjoying their beef, chicken and eggs all spring), and on Sunday I start a new monthly CSA from Frolic Farm (very excited about this one, and hope to do an update about them on Sunday after I open my first artisanal box!). 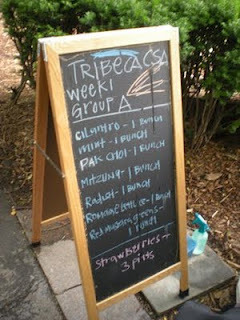 Yes, yes, I know that salad is the most lame of CSA recipes. Salad is, in fact, the reason why a lot of people never join a CSA because they worry all they’ll ever be eating is salad. While I agree that come August, the last thing I want to see is another head of red leaf lettuce, for the first share, I get overly excited by all the greenery that ends up in my fridge. As I was preparing my salad mix, I was salivating over all the incredible smells given off as my knife tore through the gentle herbs and greens. It’s not unlike that thrill at Christmas time when the smell of real pine wafts through the apartment. It’s just, well, yummy. One of the problems with salads is that they are really time consuming to put together. I create a week’s worth of salad in a large tupperware-style bowl that I store in the fridge. The biggest problem with this is that the vegetables must stay clean and dry. Nothing will spoil a salad faster than moisture. I have been able to add even items such as diced tomatoes and artichoke hearts (organic, canned) by putting these items inside a small dish and carefully placing on the dry salad mixture before sealing it shut. Of course, those of you who do not live with a NYC-sized kitchen could probably find space for all the individual containers, but I prefer to keep all my salad “fixins” in one spot. This year I am attempting to go a bit (okay, a lot) greener with my greens and switch to cotton towels. Thus, my greens are now being towel dried (as opposed to paper towel dried). While I like the convenience of paper towels, it’s such a waste, both in terms of the environment and the actual cost of the paper towels. 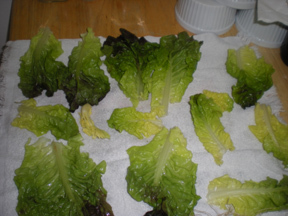 In fact, I was able to dry all my lettuce with two small hand towels (one on top and one on the bottom). I was really pleased by the results, as the greens were dryer faster with the hand towels. So, what greens did I use? Torn romaine (CSA) and red leaf (last week’s Farmers’ Market); diced combo of a few flowering red mustard greens (CSA), metzuna (CSA), cilantro (CSA), and radish greens (CSA). To this I added week old radishes (from FM; my CSA radishes are so good that I’m just dipping them in Kosher salt and eating them by themselves), some chopped baby carrots (yes, I know, but it was a moment of weakness in trying to populate school lunches, so I gotta use them up before they rot… in about six months), a bit of old celery (mostly the flowery stuff; the stalks are on their way to the compost), and a bit of store-bought Granny Smith apple. To this I added High Point Farms’ sirloin steak, which I had marinated in spring garlic (FM), cilantro (CSA), Worcestershire, salt and pepper (organic, but only because it was the only kind sold at the store! my pepper grinder broke). I diced the steak to be stored separately and added as needed. I try to use up whatever happens to be on hand. I almost exclusively use organic apple cider vinegar, even when not putting apples in my salad. I switch between olive and flax oil for the fat. And generally some kind of mustard ends up in there (whether powdered or actual). 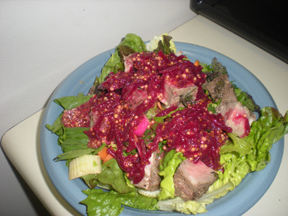 For this salad, I also added Divine Brine’s beet caviar, which I stumbled upon at the Brooklyn Flea a few weeks back. This is also where I discovered Tin Mustard; possibly the best mustard I’ve ever tasted (I literally have to stop myself from eating it with a spoon!). 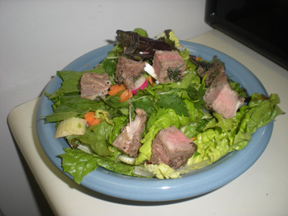 The final salad in its “dressed” form is below. Hope you make the most of your early summer salad, and enjoy!